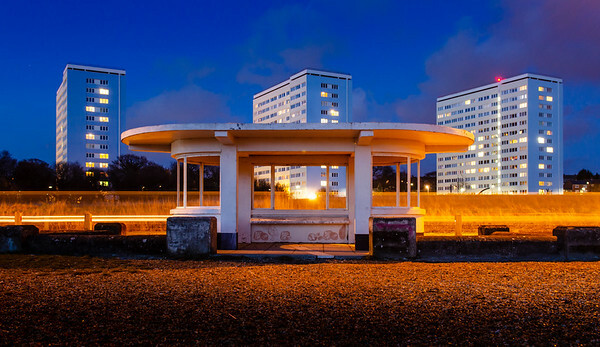 Southampton, England - February 16, 2014: A modernist 1930s beach shelter at Weston Shore on Southampton Water, with a row of three council estate tower blocks behind. 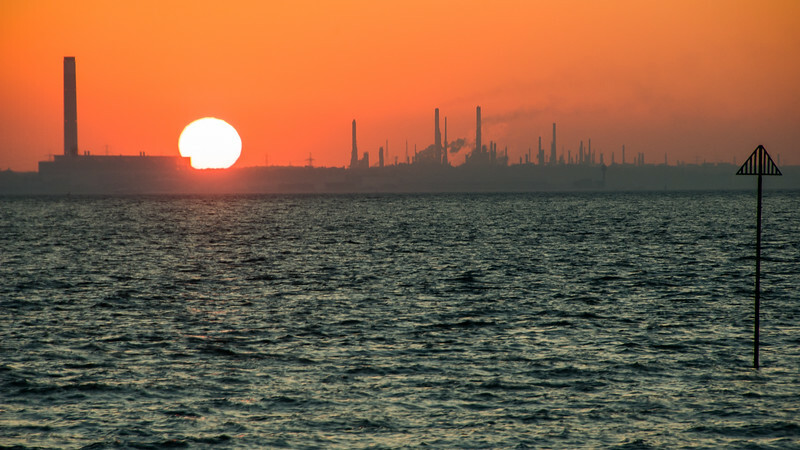 The setting sun casts a red sky and silhouettes the industrial skyline of Fawley Power Station and Oil Refinery on Southampton Water in Hampshire. 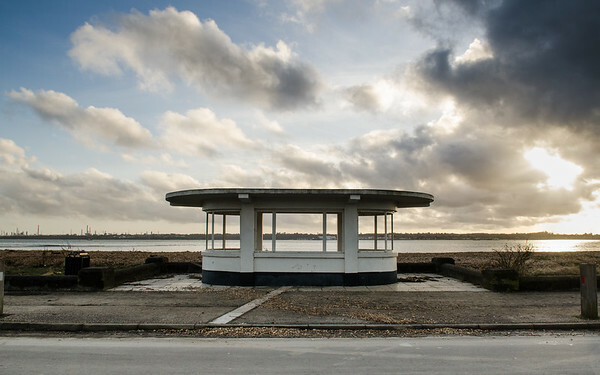 A 1930s modernist beach shelter at Weston Shore on Southampton Water. 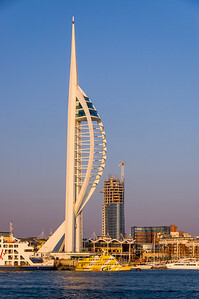 Portsmouth, England, UK - August 25, 2007: The skyline of Portsmouth, including the Spinnaker observation tower, is lit on a sunny day, as seen from across Portsmouth Harbour in Gosport. The sunset silhouettes the industrial towers of Fawley oil refinery on the shores of Southampton Water, seen from Netley. 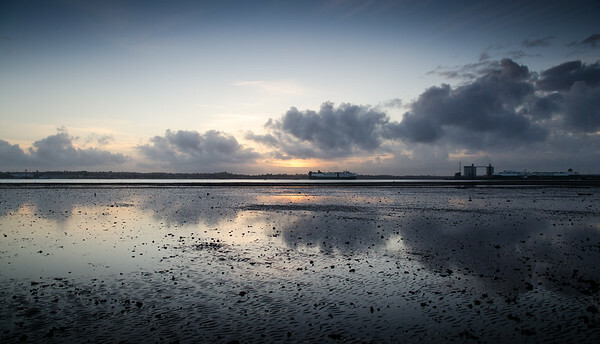 Southampton, England - February 16, 2014: A cargo ship enters Southampton Docks, seen from Weston Shore at sunset. 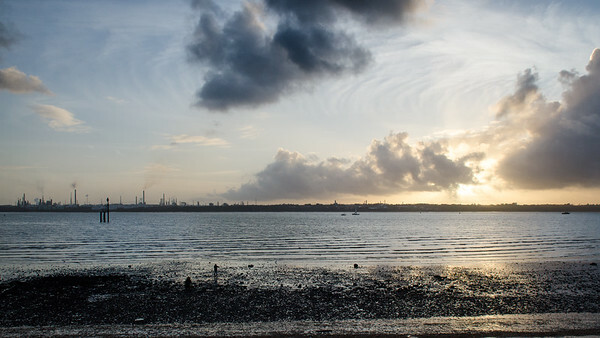 Sunset over Southampton Docks from Weston Shore. 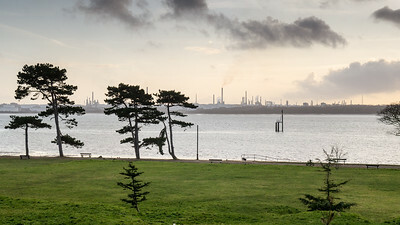 The sunset silhouettes the industrial towers of Fawley oil refinery and trees in Netley Country Park on the shores of Southampton Water. 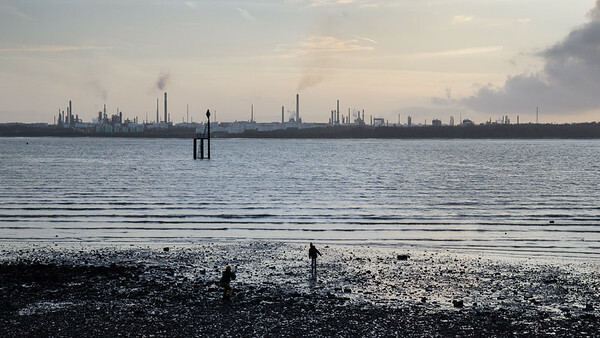 The 1930s art deco beach shelter at Weston Shore, with the 5 landmark council housing blocks behind. 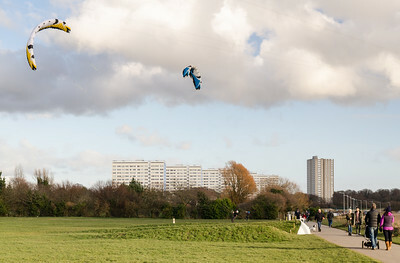 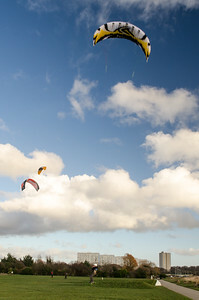 Southampton, England, UK - February 16, 2014: People participate in kite landboarding on a sunny day in a park at Weston Shore beside the council estate tower blocks of urban Southampton. 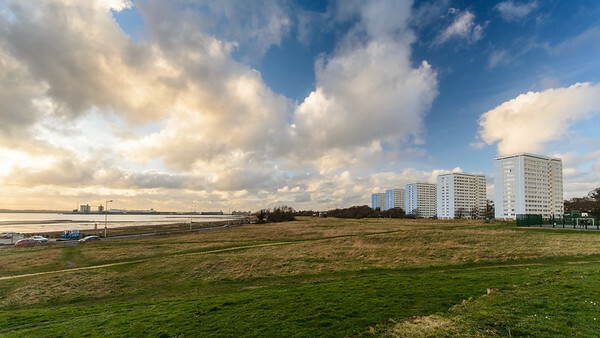 Southampton, England, UK - February 16, 2014: A row of five mid-20th century social housing apartment blocks stand in parkland at Weston Shore beside Southampton Water. 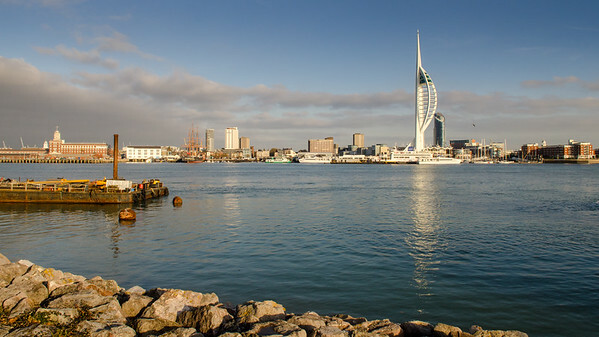 The skyline of Portsmouth, including the Spinnaker observation tower, is lit on a sunny winter day, as seen from across Portsmouth Harbour in Gosport. 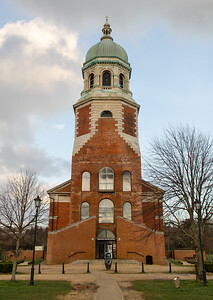 Southampton, England, UK - February 16, 2014: The hospital chapel of the demolished Royal Victoria Hospital stands alone in the parkland of Netley Country Park in Southampton. 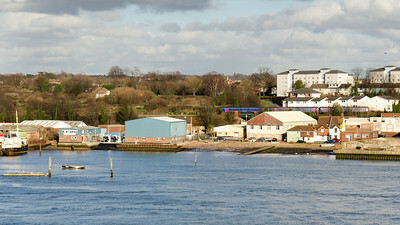 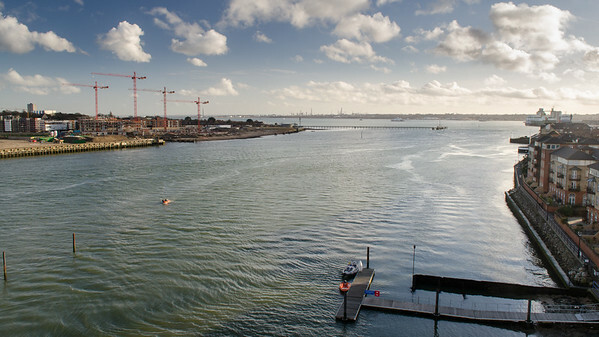 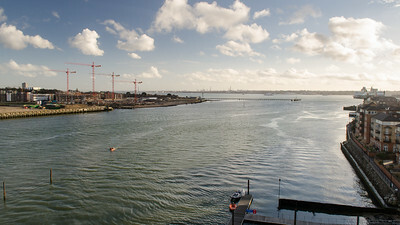 The River Itchen flows into Southampton Water between apartment buildings and construction sites in the city of Southampton. 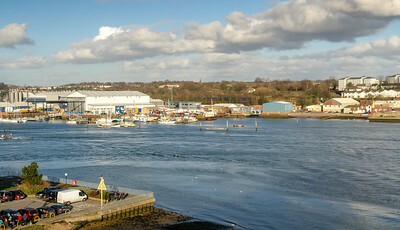 Southampton, England, UK - February 16, 2014: A First Great Western Railway train runs alongside the River Itchen in the suburbs of Southampton, on the West Coastway Line. 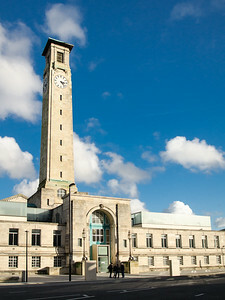 Southampton, England, UK - February 16, 2014: Sun shines on the art deco facade and clock tower of the west wing of Southampton Civic Centre.